Automatic Rain Sensor--this is used to prevent watering of your lawn during rain. Drip System--drip irrigation has really caught on in the last few years. 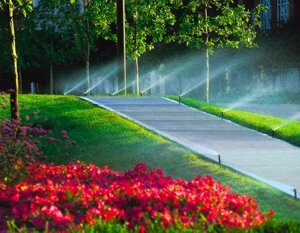 A drip system is installed to water your plantings separately from your lawn. This is useful because the watering needs differ. With drip irrigation you can deliver water directly to the root zone without wind drift or misting. It also helps to keep your hardwood mulch fresher longer than over the top methods. The system will also run when you are away.